Infosys, India’s second largest information technology services company on Friday posted better-than-expected numbers in the third quarter of 2014-15 although the employee attrition rate continued to be a concern. Attrition rose further in the third quarter. What are you doing about it? To keep employees in an organisation, you have to communicate to them and excite them to the level that they don’t leave. We are doing all of those. Also we need to grow faster so that there are more opportunities for them. We are trying to improve the work atmosphere for our teams. Sometimes people quit not because they don’t see growth, but because they are frustrated with certain processes. Over the last two years there were several softer factors that contributed to high attrition, but now we are on an upswing. Will you be hiring fewer people with increasing automation and use of new collaborative technologies? Hiring is a function of productivity, attrition, growth and so on. The innovation in productivity improvement will take some time, though we have started talking about taking it to the next level of automation. It may not dramatically decrease the number of people because the real measure is doing the same task with fewer people. We want to increase the revenue per employee. Today the revenue per employee is around $52,000 per year. In the previous quarter, Infosys saw record employee utilisation. Is there room for improvement there? We earlier considered employee utilisation at 78-80 per cent as our comfort zone but now we have upped it to 80-82 per cent. Employee utilisation will differ from quarter to quarter. In the previous quarter it was high but in January-March there will be an influx of new employees and so utilisation might be lower. How is the order pipeline looking? The pipeline is decent, though the (conversion) cycle timings are fairly large. We had three large deals with a total contract value of about $220 million during October-December. We also had five or six deals that are slightly lower than our cut-off for large deals. So even though three may seem small, we are okay. The value of large deals seems to be shifting. In the past we used to find many $200-400 million deals, but now these are few. There are hardly any billion-dollar deals. While clients may have thought about spending that much, they are splitting up orders. Can you sustain the growth that Infosys saw in the third quarter? If we want to get back to industry-leading growth, we need to continue to focus on volume. At this stage, I can’t comment whether it is sustainable. We will have a better idea in April when we have more clarity on clients’ spending. As of now, we have internally not taken a view on this. In many cases, client budgets are also not finalised yet. Whatever we know right now is indicative. A lot of things can change in three months. With a new head of M&A and a focus on the technologies of tomorrow, are you becoming more aggressive in acquisitions? We are always on the lookout, but you have to find the right candidate and find right value in them. Even before (chief executive officer) Vishal (Sikka) came in, we were aggressive. We were conservative, but in the last couple of years, we tried to be more aggressive. Probably we will look at (acquiring) technologies more closely than we did. These will be small acquisitions but the valuation could be high. The other area is looking at expanding geographic presence. The Innovation Fund you have expanded to $500 million will supplement that? That is more about working with startups, helping them scale. In the process, we may invest in a few of them. We are in advanced talks to invest in one such company. Is it not a different ballgame, being a venture capital player and managing a fund? This is the nature of the industry. The shift that is happening is much more dramatic than we have seen in the past. So now we have to do different things. We can’t look at building all the capabilities internally because that will take time. How are the operations divided between Sikka and you? Sikka spends a lot more time in trying to drive the innovation agenda at Infosys, and meeting clients. He engages with senior stakeholders and interacts with them about the scope of technology. He takes care of most of the client interactions in terms of selling since he spends more time in the market. I meet clients who visit India. I look after the delivery, and other operations, facilities, etc. Each one of us is playing to our strengths. He is a tech visionary. I try to execute his vision. 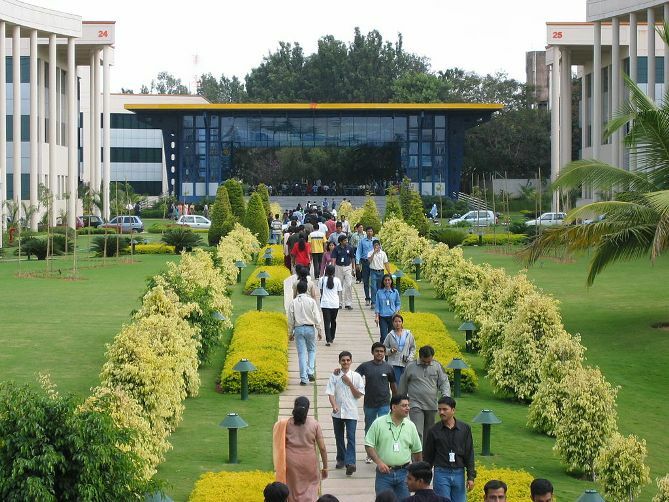 Image: Lunch time at Electronic City campus, Infosys Technologies Ltd, Bengaluru.